The Walter Camp Football Foundation has announced its All-America Alumni NFL Offensive and Defensive Players of the week for games ending November 2. About the Award: The Walter Camp Foundation has more than 300 of its All-American alumni currently on NFL rosters. The Foundation’s All-America teams date back to 1889, and the Foundation has also selected a Second Team since 1998. Each week during the NFL regular-season, the Walter Camp Foundation will recognize one offensive and one defensive player as its Alumni Players of the Week. Drew Brees completed 39-of-50 passes for 505 yards and seven touchdowns as the New Orleans Saints defeated the New York Giants, 52-49, in overtime. It is the second time this year Brees has earned the honor (Oct. 6). 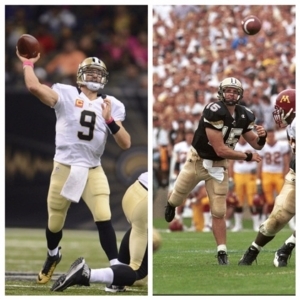 A collegiate standout at Purdue, Brees earned Walter Camp Second Team All-America honors in 1998 and 1999. J.J. Watt recorded five tackles, 2.5 quarterback sacks and one forced fumble as the Houston Texans defeated the Tennessee Titans, 20-6. A standout at the University of Wisconsin, Watt was a Walter Camp Second Team All-America selection in 2010.